For the month of November the Library has trial access to the Los Angeles Times Historical Archive, 1881-1992, from ProQuest. You can access this online archive via the E-resources trials page. Access is available both on and off-campus. Trial access ends 30th November 2016. The Los Angeles Times Historical Archive, 1881-1992, delivers unique coverage of the development of Southern California and the American West. This was a period of great change with rails connecting the East and West coast of America for the first time, oil being discovered in Los Angeles, a wave of immigration of peoples from East Asia and South America along with former slaves from the South, the film industry’s move to Hollywood and rapid expansion, shipbuilding and citrus growing becoming major industries and much more. 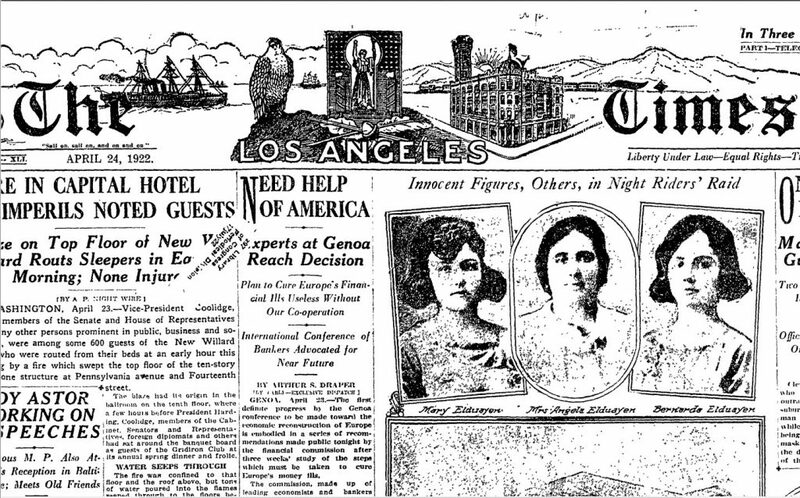 Screenshot from Los Angeles Times (1886-1992); Apr 24, 1922; ProQuest Historical Newspapers: Los Angeles Times. As well as “local” news though the Los Angeles Times gives you a different perspective on international events happening during that period. The Library already subscribes to the Historical New York Times (1851-2012), New York Tribune (1841-1922) and the Historical Washington Post (1877-1999) via the same provider and the Los Angeles Times Historical Archive provides a valuable alternative voice. Access available until 30th November 2016. The Library already subscribes to a large number of digital newspaper archives. These can be accessed on the Newspapers databases page, along with databases that give access to current newspapers. Access is only available to current students and staff at University of Edinburgh. This entry was posted in Library, Online resource, Trial and tagged Databases, History, newspapers, primary source, United States by cstirling. Bookmark the permalink.